Basic calculations have become necessary in almost all fields of work or study, and calculators help to simplify this work. 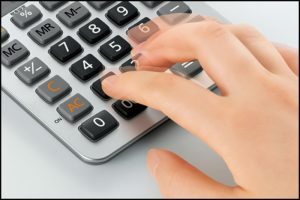 Although there are digital options available on phones and computers, the ease of using physical calculators remains. 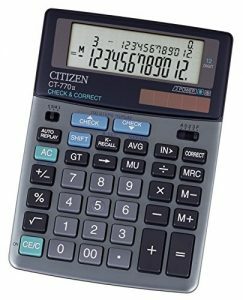 There aren’t many brands that make calculators, but there are still a lot of choices as companies such as Casio, Orpat, and Citizen all have more than a few models. This article will discuss the specifications you should keep in mind while choosing a calculator. It is aimed at general users for basic bookkeeping, numerical problems, managing taxes, and other household or school tasks. In the latter half of the article, we will provide a list of top 10 best calculators you can buy online in India. You must consider the following factors when you’re looking for a calculator to suit your needs perfectly. If you usually need basic arithmetic help, then a low-end 8 digit calculator without too many features should be enough. These types can only do the four basic operations, as well as calculate square roots and percentages. On the other hand, if your calculations are more complex, and need tax functions, check and correct, and a lot of memory, there are calculators which can do that as well. There are also financial and scientific types with exponents, permutations and combinations, and logarithm functions. Calculators are available in a variety of sizes; some can even be the size of a B5 notebook. Smaller calculators are more portable, but they can be hard to use as their keys are small too. Larger ones can have better displays, but they are more cumbersome to carry around. Usually, the smaller a calculator is, the more basic it is. Design of the keys is something you need to consider if you want to choose a user-friendly calculator. Those with rectangular keys are usually better for accuracy and comfort because the keys fit the fingertips. Try not to choose calculators with keys that are fully hidden by your index finger. For students and accountants, at least ten digits should be visible on the display of a calculator. It would not only enable them to work with large numbers but also give more accurate decimal values. 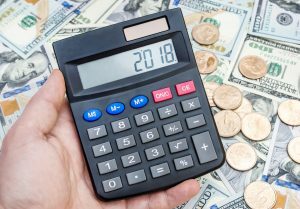 Although since money related calculations often contain large numbers, the ideal choice would be a 12-digit calculator. Your calculator should be able to withstand the force used on keys during fast calculations. It is better to invest in a sturdy calculator than a potentially fragile one. A lot of calculators also come with rubber grips at the back to prevent them from slipping or falling. Nowadays, most calculators, aside from low-end models, come with the key rollover feature. This feature helps the device recognise the correct order when multiple keys are pressed in quick succession. This is an important function, because, without this, the accuracy of the calculations would be compromised. If you’re someone who works really fast, then we strongly recommend you to check for this function. 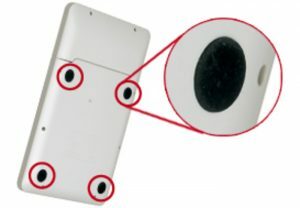 Another useful feature is a foldable or tilt screen as it improves visibility. Since LCD screens are not very clear when looked at from certain angles, it helps to be able to tilt them, so they align with your line of vision. There are some other useful features which you may want in your calculator too. A GT key, which is the Grand Total key, would be useful for calculating the sum of all previous results. It prevents you from wasting time on manually adding all the results at the end. You may also be interested in the Memory function to store a certain number of previous calculations for reference. These two features would be particularly useful for those who deal with accounts and statistics. 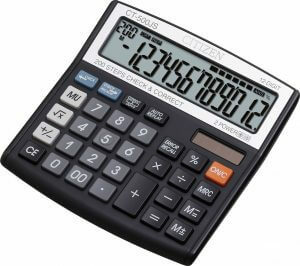 We shall now give you a list of top 10 best calculators you can buy online in India. 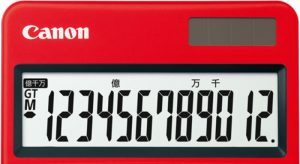 We’ve only mentioned calculators which can display 12-digits at the least, and are solar plus battery powered unless described otherwise. This is a calculator for those who want a 12-digit display and only need the basic functions. The large display makes it easier for the user to view the numbers. It is also very conveniently sized as it can fit your hand and you can carry it around. Another plus point is its dual power battery, which allows it to run on normal batteries as well as solar power. On the downside though, it may seem quite expensive for a simple calculator which lacks any complex functions. 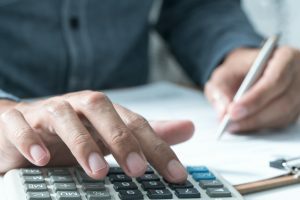 Since it does not have the tax functions, if you’re someone who needs to calculate taxes quite often, this might not be the right choice for you. It may also seem too small for those who are used to working with bigger calculators. If you’re not into complex features and want an inexpensive option for daily needs, this is the one for you! It has a large display, big keys, check buttons, and an auto replay button. All of these would come in handy when you’re managing your daily expenses or for simple calculations. It also has an angled screen so you can view it from various angles. Although, it does lack some of the features necessary for finance related calculations, such as the Grand Total button. The keys are also on the softer side which makes it hard to press them and may slow down your work. If you do not like to compromise the speed of your work, then this might not be the best option for you. For those looking for an easy to carry, lightweight calculator, this would be the right choice. It is quite small and weighs only nine grams, but it performs all basic mathematical operations. If you’re not too worried about the price and only concerned with buying the most portable option, then this is the one for you. However, there are a few negatives to this calculator, the biggest one being the price. 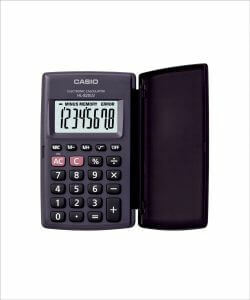 It is the most expensive product on the list and may not seem like a justifiable investment for a basic calculator. Furthermore, since it doesn’t have a large display, it can only show 8 digits, which makes it hard to deal with calculations involving large numbers. All those who only do simple calculations and are sick of using dull calculators would love this product. Aside from the unique colour scheme, it has a clear display, easy-to-press keys, and is quite small in size, which makes it a great choice for those looking for portable options too. Additionally, while most basic calculators only have 120 steps check available, this one has a 300 steps check. Since it is a simple calculator, it doesn’t have the tax function and GT keys, so it’s not useful for those working with finances. 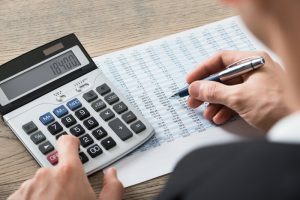 It may also seem quite expensive for the functions it performs, so if you’re looking for a more budget-friendly option, then there are some other basic calculators on this list which may appeal to you. This calculator is inexpensive, small, and lightweight, but also quite sturdy so it will last you for a while. You don’t need to worry about its display and keypad either as it comes with a flip cover for enhanced protection. It is the perfect choice for those looking for a product that can fit into their back pocket. It also comes with a three-year warranty so in case you damage it, you can always get it repaired. However, due to its size, it only has an eight digits display, and it isn’t dual-powered either, so it cannot run on solar power. It may also seem harder to use for those used to plastic keys as this has soft, rubber keys. Lastly, if you require complex calculations, this will not suffice, and you should consider one of the other calculators we’ve mentioned. 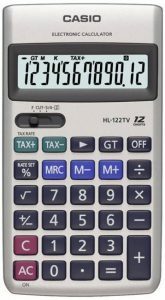 Dual-powered and sturdy, this calculator also has a large, twelve digits display for easier viewing. The display works well even in areas with poor lighting, and the dual power helps it last for almost two years. It also has a fast response rate, so if you’re someone only does simple calculations and really values speed, then this is the best choice for you. 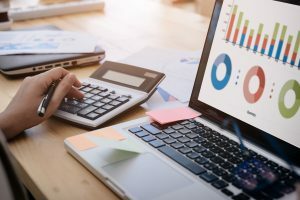 On the downside though, it does not have most of the features needed for financial calculations such as the Grand Total key and the tax rate keys. Therefore, it would not be suitable for those who manage accounts, calculate taxes, or work with finance quite often. 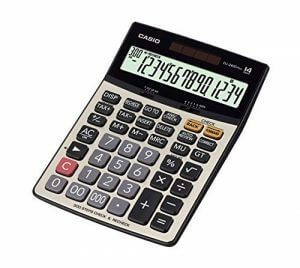 It may also seem quite expensive in comparison to other calculators, especially for simple calculations. With a huge keys layout and a large display, this is the perfect option for anyone looking to minimise their chances of errors while doing calculations. 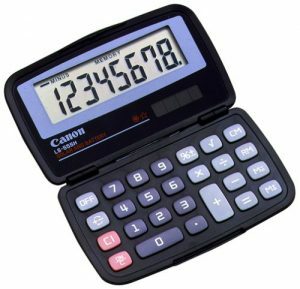 It is almost as big as a small tablet or keyboard, so it would be great for those looking for a desk calculator. Since it can also perform tax functions, it could be used by those engaged in accounting and bookkeeping. However, due to its size, it would not be appropriate for those looking for portable options. This may also not last as long as it isn’t dual powered and cannot run on solar power. Furthermore, those who do not like using plastic keys, will not enjoy working on this either because its keys are identical to keyboard keys. If you’re looking for the best small, portable calculator, then this is the one for you! It is durable and lightweight with a pretty big display and a long battery life that lasts for two years at the very least. It also performs calculations relatively quickly, so it would suit even those who do not like to compromise on the speed of their work. It has additional keys such as the Grand Total key and the tax function keys, therefore it can also perform more complex actions as well. Since it is not limited to basic functions, it is a suitable option for students and professionals involved in the field of finance. 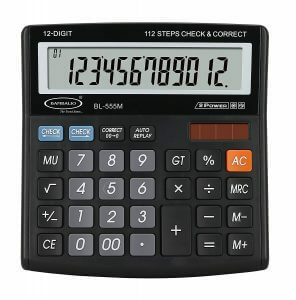 With a large, three-line, twelve digit display, it is easy to view the steps for a calculation along with the result on this calculator. 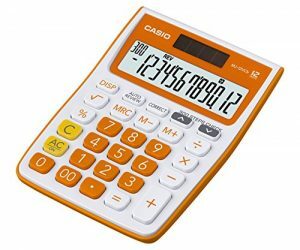 It can perform additional functions such as calculating the average as well, which makes it suitable for those who want a few extra features but do not wish to invest in a scientific calculator. This product would be particularly helpful for those who use statistical calculations regularly. It would also be a good match for students and professionals engaged in the field of finance. Although it is on the pricier end, the numerous functions it can perform makes it a worthwhile investment. 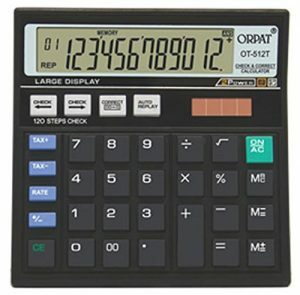 The best desk calculator on the market, it has huge keys, a large fourteen digit display, and can perform several functions. It is almost A4 in size, and its big keys help avoid errors while typing. 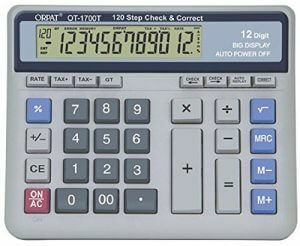 Its huge display enables you to work with large numbers and complex decimals without any troubles. It also comes with a 300-steps check and correct function. Additionally, the keys do not make any noise, so you do not bother anyone while using it at the office. It also comes with “000” key which allows you to insert large numbers much faster, and it can separate digits based on the Indian numerical system as well. It is an expensive product, but it is perfect for professionals working with finances and commerce. Whether you are a student, a professional, or merely someone who regularly records their daily expenses, finding the right kind of calculator will help make you more efficient and accurate. We hope our article helped you understand your needs better and how you can choose a calculator based on them. We also hope that you were able to find the best calculator for yourself from amongst our recommendations.